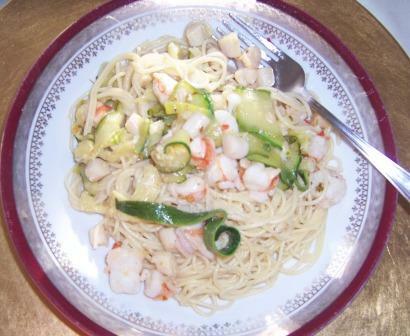 I first tasted this meal when my husband (who never cooks) made it for me. You know, when we were still dating…:) I wasn’t familiar with seafood so much those days. It was a simple and soooo delicious dish. I started to make it myself and as the time goes, I was adding little more of my tweaks to it. 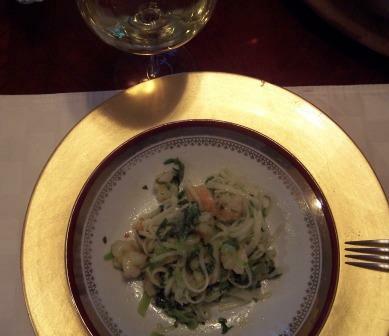 Recently, I bought a bunch of bok choy cabbage and decided to use it in my shrimp scampi. You can leave it out if you don’t care for it, but it came out really good! In a large frying pan melt butter with olive oil on medium heat and add red pepper flakes (if desired). Add chopped leeks, turn down the heat and let saute on low for 5-10 minutes until translucent. When caramelized and soft, add white wine to the pan and de-glaze it. Cover the pan and cook few minutes until all the shrimp is pink. Don’t over cook the shrimp though, it only takes a short few minutes. In the meantime, boil large pot of water, heavily salted and cook your pasta based on the instructions, drain and return to the pot. Add a splash of olive oil, stir and keep hot. Add pressed garlic into the shrimp and stir well. Taste and season with salt and pepper, if needed. Rinse and chop bok choy cabbage. Add to the mixture and let cook for another minute. Add cooked hot pasta and toss together. Garnish with basil and parsley. Buon appetito! I have tasted a lovely, fresh Huber Hugo Grüner Veltliner (Austria) with this dish and it was so refreshing! Another choice was my long time favorite Las Brisas from Spain. The Spanish wine added a lot of character because of the expressive Sauvignon Blanc, but Huber was a superb match with shrimp scampi in my opinion. 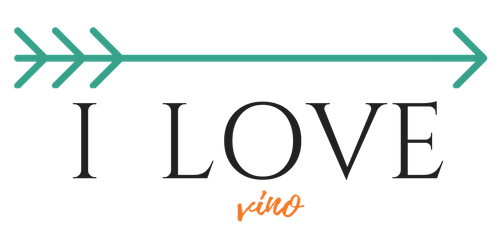 Both great wines for spring and upcoming summer! I have been a star of dinner parties when making this Italian classic. It is very impressive when you bring this beautifully smelling dish in the middle of your table. 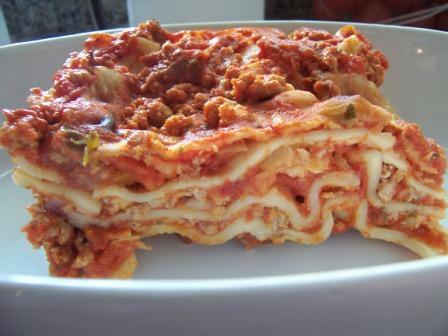 Not too many people knew lasagna in my home country than and everybody just loved it. And where did I learn how to make it? From my friends in Holland! A little crazy crossroad, isn’t it? Whatever the story and location, this is a simple, all-in-one-dish dinner that nobody will complain about!When I first came to U.S.A., we stayed at our friend’s house for the first few weeks, before we settled in our own apartment. 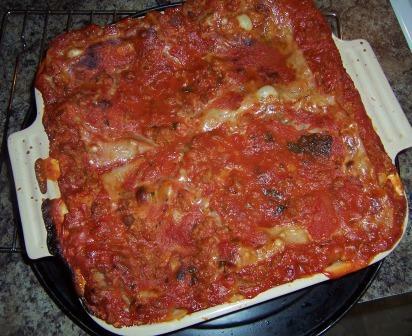 One evening I offered to cook dinner and decided to make “my lasagna”. My dear friend Leo invited his 87 years old Italian mother to join us! Oh dear! My “Czech version of Dutch lasagna” made it though. except, I didn’t know how to work the ricotta cheese and it thinned the sauce a little. Other than that, approved! Leo’s mom was too kind! In a large pan heat olive oil and saute onion until soft. Add dried oregano, 2 diced cloves of garlic and sliced leek and let cook until soft. Add ground meat and Italian sausage (without the casing) to the pan and separating with wooden spoon, fry until browned. Season with salt and pepper. If you like mushrooms, add them now and saute for another minute. 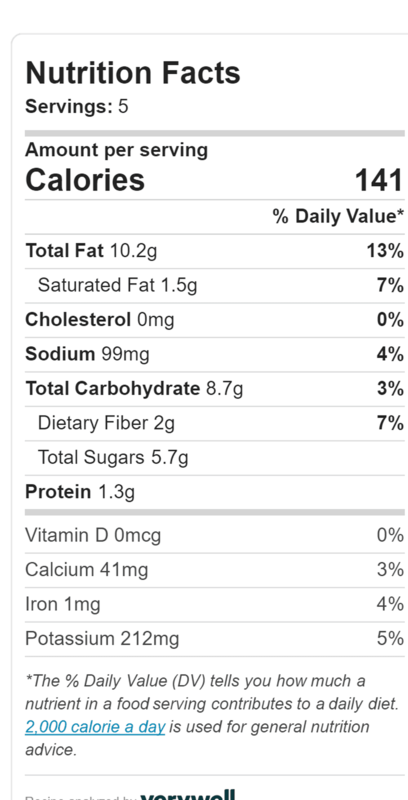 When the meat is cooked through, add whole can of diced tomatoes (juices included) and large can of whole tomatoes (unless you decided to use store bought marinara sauce) instead. Break whole tomatoes carefully in your hand before adding to the pan. Turn down the heat and let cook for ten minutes. Season with ketchup. At the end, finish the sauce with freshly chopped basil, add pressed rest of the garlic and my little secret – heavy cream. It smooths the sauce like a little cross over “bechamel meets marinara”. Stir, cook an additional minute and turn off.In an oven proof dish ladle a little bit of sauce to cover the whole bottom, cover it with lasagna noodles (I never cook them ahead, they cook through with the sauce – another secret I learned in Holland). And not, you don’t have to use the “no need to precook” kind. Any kind of lasagna pasta works the same with this recipe. Just cover the sauce with dry pasta. You may have to crush the corners or ends so it fits to your skillet. Cover your sauce with pasta and add a second layer of sauce. Sauce must cover the entire pasta! Add layer of shredded mozzarella, pasta, sauce, and so on until your dish is full. Top layer must be the sauce. Sprinkle the rest of the cheese on top and put in the oven. Again, if you used 8×8 dish, and that’s enough for 4 portions of lasagna, it can easily fit into my favorite kitchen appliance (you guessed it) toaster-oven. So no need to pre-heat your big oven. Turn your timer on 45 minutes at 375 F (you may want to put your dish on a sheet or aluminum foil, if you topped it all the way to the top with sauce, since it may go a little overboard while cooking. That’s all you need to do and walk away.When lasagna is done, take out your dish, let it cool for a few minutes, bring it to your table and let your family to dig in. Bon Apetito! Note: you can use layers of Ricotta instead of shredded mozzarella. Just don’t make the same mistake I did the first time (I never worked with ricotta cheese before). Before you use it for your lasagna, mix Ricotta with 1 whole egg and season it with salt and pepper. This way you wouldn’t end up with watery sauce like I did the first time :). I paired this dish with (naturally) Italian Chianti called Cetamura from Badia a Contibuono in Tuscany. This wine’s acidity pairs perfect with the tomato sauce in lasagna. Those Italians, they know what they are doing! 99% of time when we feel like pasta in our household, spaghetti or similarly shaped pasta wins. 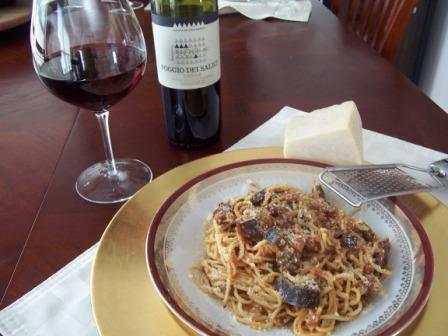 But this simple and tasty recipe goes well with any other kind of pasta you personally prefer. Bring water in a large pot into boil, add tablespoon of salt and cook your pasta “al-dente”. Drain, sprinkle a little bit of olive oil into cooked pasta so it wouldn’t stick, and mix. Reserve about 1/2 cup of pasta water for your sauce. In the meantime, heat up the butter until melted in deeper pan, add olive oil and slices of zucchini. Sprinkle with a little bit of the seasoning mix and saute, stirring regularly, on medium hot until soft (about 2-3 min.). Take cooked strips of zucchini out of the pan with fine mesh spoon and set aside. Add all the seafood to the hot oil and butter, and sprinkle with seasoning. 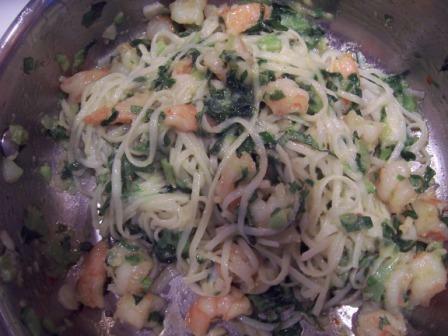 Add pasta water, mix together and quickly saute, stirring it regularly, until shrimp is pink on all sizes (about a minute). Add chopped garlic and cooked zucchini strips. Combine and pour over cooked pasta. With this meal I opened a new vintage of Alta Vista Torrontes from Argentina and it was delicious together. Some of you, Vera Wine Club’s members may remember this wine from our Argentinian Luncheon at Fleming’s – few years ago. It was quite a success. If you didn’t taste it yet, you got to try a bottle.